I posted several times related to integration issue with Eurorack systems in the past. I thought it would be interesting to share my conclusions from various experiences and research. Below is a graphical summary of my current system, in which Pyramid plays a major role. This is state of the system “at home”; the whole system is portable and can be used (with some slight modifications) on stage. I invite others to share their own Pyramid-Eurorack setups in this thread. Oooh yes, let’s get this discussion going. I don’t have a nice diagram like yours (nor time to put one together) but I will hit the same key elements that you do. I use MIDI very heavily in my “performance” Eurorack rig, which is currently set up in my home studio for practice purposes. 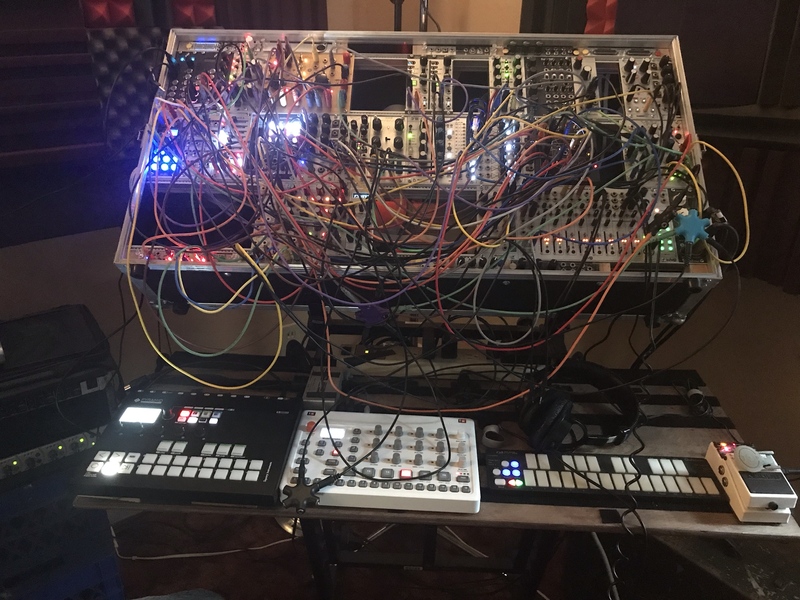 What follows is a description of that performance rig and how it connects to itself and to my studio. I use an iConnectivity mio10 as my central MIDI router - all devices connect directly to it and only it, and it handles all message distribution, merging, filtering, etc. In terms of MIDI communication, picture this topology like a star with the mio10 in the center. Eurorack rig - Using Expert Sleepers FH-2 for MIDI-to-CV for melodic voices and general control signals and Erica Synths MIDI - Trigger for drum gates. 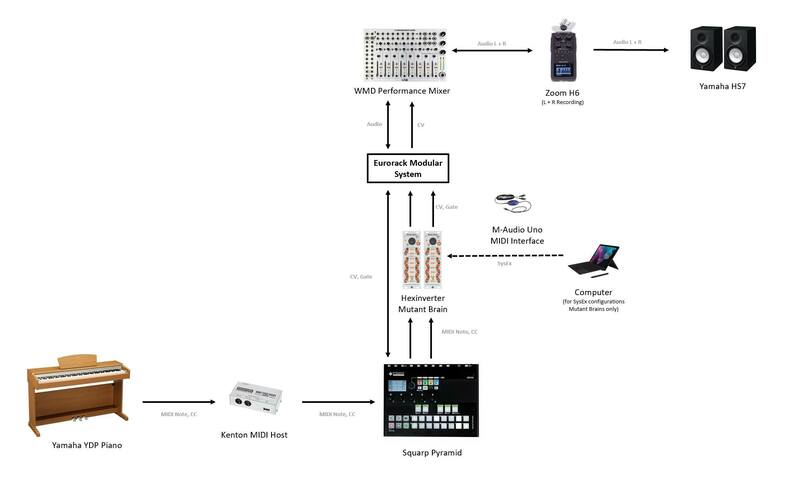 My studio PC connects to this rig by way of another iConnectivity mio10 - I try to capture all MIDI communication from my performance rig in Ableton via 16 MIDI tracks dedicated to each of the MIDI channels on that mio10 port. This only works properly about half the time, usually due to some oversight on my part at the last minute. Behringer mixer outputs to my Focusrite Scarlett 18i20 audio interface to be recorded by my PC. If I don’t have a show coming up soon, I will remove the mixer from the chain so I can record separate tracks for each of the channels the Behringer would otherwise be mixing together. Currently all of my MIDI is via 5-pin DIN, I only use USB when there is no alternative (which thankfully is not necessary with this rig but I do have several devices that are USB only). I think the “star” setup with one good device in the middle makes a lot of sense in mixed environments like yours. The special thing about my setup is that it consists of Eurorack voices only; so MIDI-CV/Gate conversion is a major topic for me. I plug my Pyramid into the Expert Sleepers FH-2 to control a voice based on the Endorphin…es Furthrrrr Generator along with a few drum modules (BIA, GMO, Neuron) triggered with Pyramid’s Euclidean sequencer. Expert Sleepers General CV is used as a fully midi controllable GM synth along with additive and Granular mode controlled by Pyramid via Midi. Mutable instruments Braids-based voice controlled by Pyramid CV outs. Elektron Model Samples is slaved to Pyramid, and I will be adding an Audiothingies Micromonsta soon as well. I am really loving the Pyramid. Basically everything I have tried to do works. Seems like a great community here too. Some great setups right here in this thread.